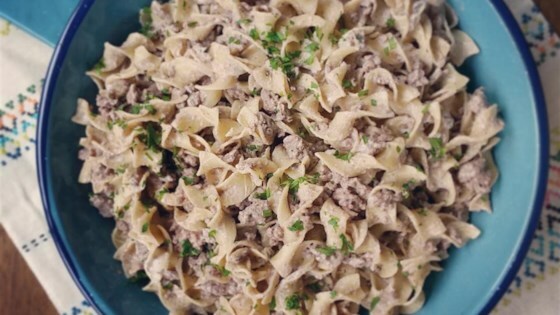 "This is a very simple and quick beef stroganoff that can be made after a busy day at work. It uses ground beef and mushroom soup!" In a separate large skillet over medium heat, saute the ground beef over medium heat for 5 to 10 minutes, or until browned. Drain the fat and add the soup and garlic powder. Simmer for 10 minutes, stirring occasionally. Remove from heat and combine the meat mixture with the egg noodles. Add the sour cream, stirring well, and season with salt and pepper to taste. A quick and easy dinner recipe with beef and noodles in a creamy mushroom sauce. This is good, but wanted to pass along this hint: try adding a package of DRY HIDDEN VALLEY RANCH dressing mix to it... oh my gosh - it is SO GOOD! If you saute fresh mushrooms, onion, and garlic (skip the garlic powder) to add, and add some Worcestershire sauce this comes out so much better for not much more work.